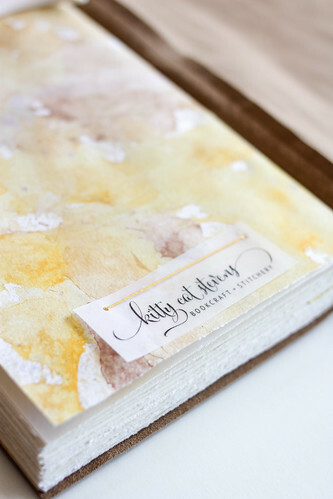 I'm so excited to share my most recent handmade book with you today! It was a custom order for a Mother's Day gift and I dare say that it turned out even better than I imagined. 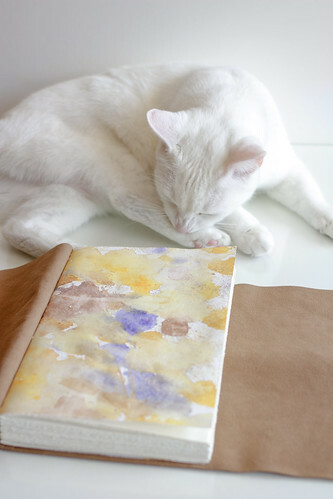 This journal was created for my friend's mom, who is a painter. This piece was fun because I don't actually know my friend's mother and I pretty much had free reign. After a short Q & A session with my friend, I had a vision and just went for it. 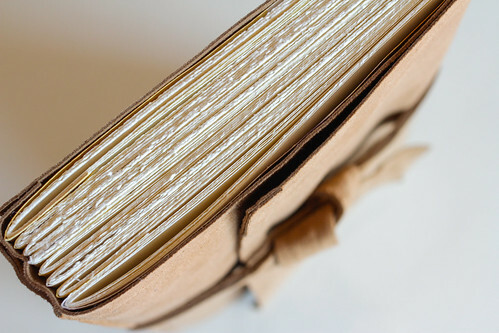 I started with a rich light brown leather cover. 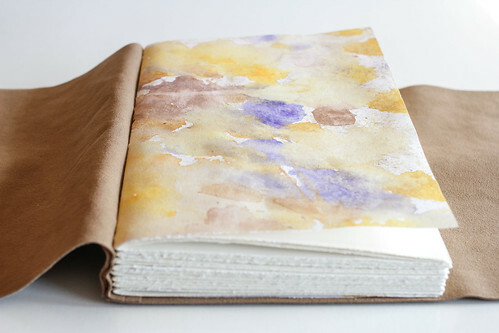 Bonus points because the cover is completely upcycled from *drumroll please* . . . a secondhand leather skirt! The strap is actually the old waistband of the skirt— CAN YOU TELL?? 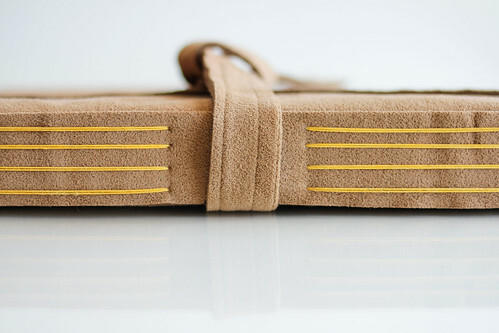 This binding is called "longstitch" and allows a beautiful contrast of thread on the spine. 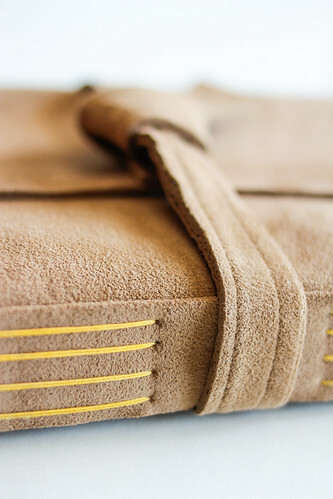 The spine has an additional strip of leather sewn on for aesthetics, stability, and if we're being honest— because I totally messed up the original holes I punched and needed to cover them up. WHOOPS. Happy accident though, no? I kind of love it. 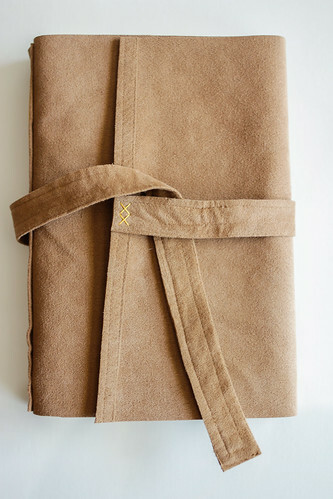 The leather is so soft and buttery— the perfect texture. 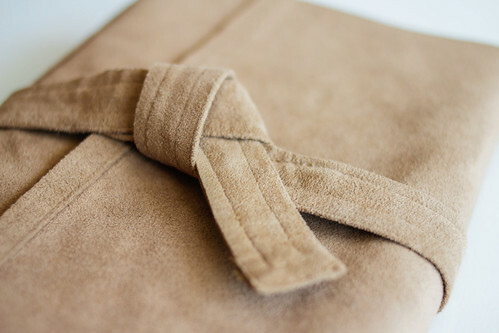 It's also very thin, so it was challenging to sew. There are some wrinkles and a bit of bulging on parts of the spine, which is not ideal to the perfectionist in me, but the artist part of me appreciates that you can tell it wasn't made by a machine. And secondhand leather— come on! I totally saved some poor unfortunate soul from wearing this mid-shin length leather travesty. 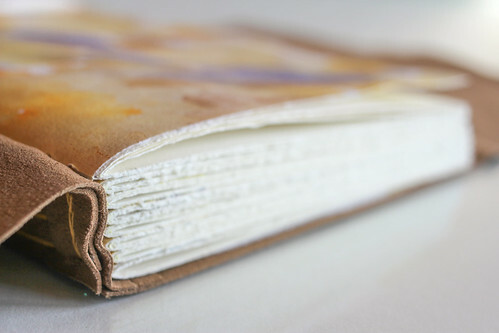 The inside contains 160 hand-torn pages that create a lovely deckled edge. I am a complete and total sucker for a book with feathered edges. The cover sheet and signature protectors are all made from paper that I watercolored myself. I am so proud of that watercolor, too! It is a "technique" that I "mastered" a few weeks ago when I created my first wedding guestbook (oops-- secret's out!!). I can't wait to share that guestbook, but it's totally one of those annoying "top secret projects" that I can't talk about yet [GROAN]. But I will tell you that it was in collaboration with Stockroom Vintage— so you should expect lots of dreamy goodness. If you're sleuth enough, you can lurk my instagram and find a sneak peak of it. ANYWAY. Secondhand leather. Watercolor. Hand-torn edges. This book is very "Kitty Cat Stevens." 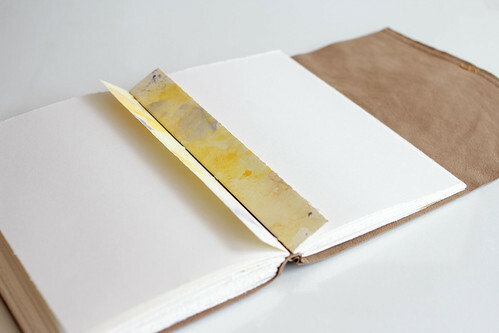 It's a huge amalgamation of pretty much everything I've learned about bookmaking. Like when you think about it, this book took me 6 years to make. I'll just let that sink in . . .
Lastly, I would be much remiss if I didn't mention a few more things. 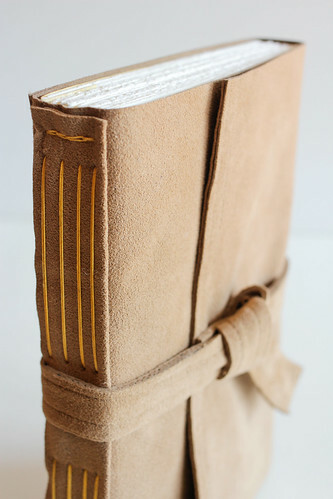 Although this is the first time I have done this particular longstitch sewing pattern, it is actually the second time I've made a leather longstitch journal. 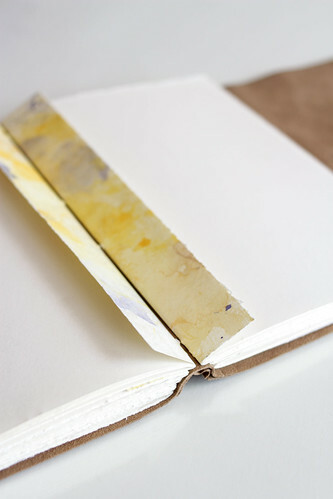 The first time was in a class taught by Katie Gonzalez, a local bookbinder and owner of Linen Laid & Felt bindery. She's also the one who taught me a slightly easier version of how I was tearing down paper, too. 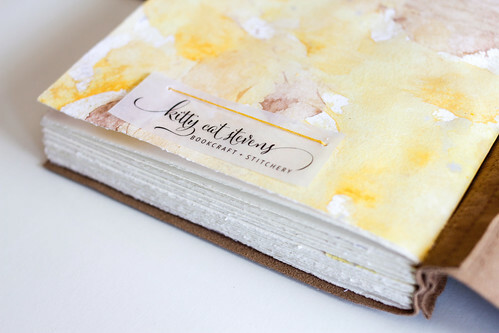 I never posted pictures of the journal I made in Katie's workshop because it didn't feel 100% like mine, ya know? I mean, it was essentially me learning how to make her signature book. But that's the thing I love about bookbinding— you can teach a room of 20 people the same binding and still get 20 different books at the end. So that class gave me the confidence to go ahead and experiment with leather and really take what I learned and make it my own. Whew. I think that's everything I wanted to say. Well, besides a few "housekeeping" things. As I mentioned in my last post, I'm doing my first handmade market next month— eeeeep! Which means even though I'll be making lots of things, I will be allotting nearly all of my free time to finishing up May commissions and creating inventory, so things might get quieter around here BECAUSE PRIORITIES. So if you'd like to see me more than once a week, let's hangout on Instagram. Although I won't be on the blog as often, I swear I am so fired up about everything to come! Once the market's done, I'll be focusing on my new website/shop. So if you're reading this through Google Friend Connect then I recommend going ahead and following on Bloglovin instead. That's all the blog talk I have. I have more books to share but I'm still trying to find a balance so I don't overwhelm y'all with ME ME ME books books books. Okay that's all I have to say— I hope you are doing wonderful! When my friend saw his mom's book he said, "That's so beautiful I want to cry." So basically I hope your life is so good you want to cry. But not really because then you'd be crying . . . but you know, I really hope you are doing well. Y'all are great for reading all the silly things I say and I am beyond lucky to have your support. OKAY TOO MANY FEELINGS, BYE NOW.